Below are some Frequently Asked Questions, sorted by category. When are Shareholder distributions made? All Calista Corporation Shareholder and Elders Benefit Program distributions are subject to approval from the Board of Directors. Through March 2019, Calista has declared $71.2 Million in Shareholder and Elders’ Benefit Program distributions. Spring: formula based on Shareholders’ Equity. These are generally distributed in April or May. Akilista: formula based on the Akilista investment portfolio, which saw its first distribution in 2014. This is an investment fund created to provide a perpetual source of distributions not dependent on business operations. These are generally distributed in November. 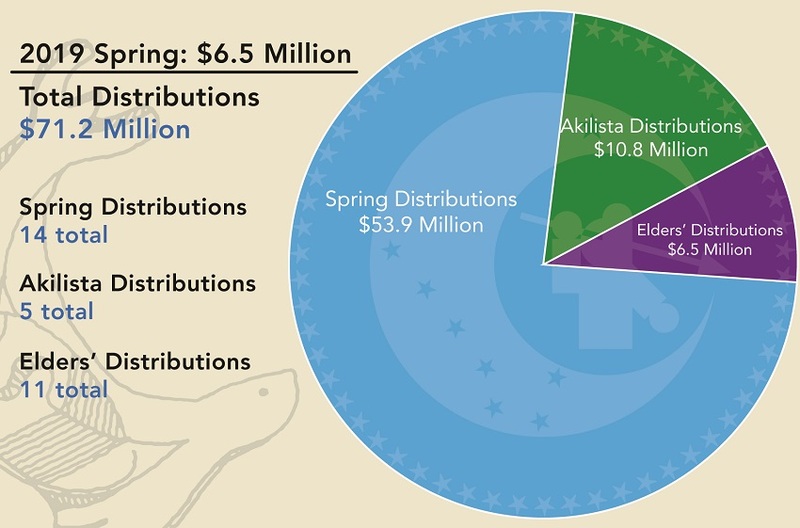 Elders’ Benefit Program distributions are for original Shareholders. An Elder is someone 65 years of age or older. These distributions are generally sent out in late December. Shareholders voted to approve this program through an advisory resolution vote during the 2007 Annual Meeting of Shareholders in Chevak, Alaska. Please stay tuned to this website, our Facebook page and our free email newsletter for all the latest news and announcements, including Shareholder and Elders’ Benefit distributions. How long does is take for distributions to arrive? Direct deposit: The same day as the distribution, but verify with your individual bank. Mail: 2-3 weeks or longer, especially in rural Alaska, from the day of distribution. Get direct deposit and don’t worry about lost, late, or stolen mail! No – at the 2018 Annual Meeting, Shareholders voted to approve the creation of a Calista Corporation Settlement Trust. This Trust allows future distributions to be non-taxable. Note: 7(i) revenue sharing distributions are taxable. Only Class B (At-Large) shares receive 7(i) distributions. How can I update my address, phone, name, etc.? MyCalista.com is a free online portal for Shareholders to access his or her Shareholder account. Mailing address, phone number, email address can easily be updated here. The Common Forms page on this website also has forms to update your info, including name, mailing address, and more. Why is it important to keep my address updated? The Shareholder addresses are used for mailing the Calista “Storyknife” newsletter, for annual meeting election mailings, for mailing of notices relating to various corporation information, and for invitation lists for events concerning Shareholders. In addition, as the corporation continues to progress financially, the addresses will be used to mail dividends to Shareholders. Do I have to execute a will for the village corporation if I already have one for Calista? Yes. Calista Corporation and your village corporation are two different entities. You need to complete a will for each entity. The Common Forms page has the Calista Stock Will form and all non-enrollment forms. What regulations control the inheritance of ANCSA Corporation stock? ANCSA and the Alaska Statutes set out the procedures for determining inheritance of your corporation stock. A will is a legal document that states a person’s wishes concerning the disposal of property such as ANCSA stock. If a will is valid, then the shares are transferred to the inheritors in the amounts specified in the will. If a will was not written or cannot be found, after a period of time it is assumed that the deceased shareholder did not leave one. When a person dies without a will the Alaska Statutes provide guidance on who will inherit from the deceased. If I want to give some of my inherited shares to my Descendant(s), can I do that? Yes. In 1987 Congress amended the Alaska Native Claims Settlement Act to allow Shareholders to be able to gift stock to eligible Descendants. Calista has a gifting policy in place. Eligible recipients are brothers, sisters, children, grandchildren, great-grandchildren, nieces and nephews. Can ANCSA stock/shares be sold? No. ANCSA doesn’t allow ANCSA stock/shares to be sold. I hear people say stockholder and shareholder or stock and shares when referring to Calista. What’s the difference? What’s the difference between Class A, B, C and D shares? Class A and B shares are original shares and can be gifted or inherited. Class C and D shares are new enrollee shares and are life-estate only. Class A: Original shares tied to a village corporation. Class B: Original shares not tied to a village corporation, also called At-Large. Class C: Descendants (child, grandchild, great grandchild, etc.) of an original Shareholder. Class D: Missed enrollees, those that missed enrolling as an original Shareholder in 1971. Can Calista assist Shareholders with legal problems? Good question. While there are too many to list here, Calista Corporation encourages all of its Shareholders to be active and engaged at both the Regional and Village Corporation level. Each corporation is a separate, independent corporation. However, your rights as a Shareholder of a corporation in Alaska are the same whether you are a Shareholder of a Regional corporation or of a Village corporation. Alaska Statutes can be found on the internet at the state website or at the Alaska Legal Resources Center website. How often do jobs become available within Calista Corporation or its subsidiaries? Note: To view current openings, click “Job Openings” under Employment. As we continue to grow as a corporation, there will be many job opportunities throughout Calista Corporation and its subsidiaries. Generally, subsidiaries must first bid and be awarded new projects before we are able to begin recruiting for the positions needed. Many projects we bid have Shareholder preference, however, some contracts, by law, state we cannot have Shareholder preference. It is the intent of management to continue to bid new projects that will enhance Shareholder hire within our corporation. If you are seeking a job with Calista Corporation or any of our subsidiaries, visit the Job Opportunities page to submit your online application for any position you are interested in. If you are a Shareholder or a Descendant and there are not any positions you would like to apply for, you may still be interested in taking the time to apply to our Talent Bank. Once we have your information in the system, we can contact you if any future openings become available that you are qualified for or interested in. Why haven’t I heard anything back regarding my resume and/or application? We receive a large number of resumes and applications in the HR Department each week for the job openings at Calista and our subsidiaries. In addition to those, we frequently receive unsolicited resumes for jobs that aren’t currently available or being recruited for. While we make every effort to maintain contact with all applicants, due to the large volume of job inquiries received this is not always possible. If you are concerned about whether your application or resume was received, please feel free to call the HR department and we will check for you. What applications do I need to fill out? If you are a Shareholder of the Calista Corporation or are a Descendant, we strongly encourage you fill out a Talent Bank application. If you are applying for a specific position with Calista or one of our subsidiary companies, you will also need to fill out a Calista Corporation application. You only need to fill out the application once; it can be used for any future job opportunities with Calista or our subsidiaries that you may be interested in. Who do I contact about information on the Talent Bank? You will need to contact by phone (907) 275-2800, fax (907) 275-2927, or email at hr (at) calistacorp.com. How often do we search for positions for Talent Bank applicants? Frequently, the HR department receives job vacancies from Calista, our subsidiaries and outside sources and companies. Once we have posted openings, we check the Talent Bank first to see if there are any qualified Shareholders or Descendants. We then notify Shareholders and Descendants in the Talent Bank interested in or qualified for the position. We also keep a listing of open positions on the bulletin board at our Anchorage headquarters. Additionally, the Talent Bank is sometimes used to notify Shareholders and Descendants of training or scholarship opportunities, as well as temporary work opportunities that may be of interest to them. Why haven’t I been hired if I have a Talent Bank application in the system? The Talent Bank is a program in place to help Shareholders and lineal Descendants locate available work. After the HR department contacts you regarding an opening that might be a good fit for you, it is your responsibility to follow up by submitting an application or contacting the employer if it is not an opportunity with Calista Corporation or any of our subsidiaries. The Alaska Native Claims Settlement Act (ANCSA) became law on December 18, 1971. The legislation settled land claims with the Alaska Native population, establishing 12 active regional corporations and transferring to them a total of and $962.5 million and 43.7 million acres of land. All Alaska Native village and regional corporations had to make their ANCSA land selections by a 1975 deadline – less than four years after passage of the Act. The corporation worked for three years to assist all 56 Calista village corporations meet their filing deadlines. Calista collected and compiled roughly 200 different types of data within the 56 areas withdrawn for each village, including information about subsistence harvesting; fish and wildlife habitats; furbearer, mammal, waterfowl and plant ranges; soils; climate; mineral potential; and fishery potential. With this data collected and disseminated through local meetings, all 56 villages were able to make informed land selections by the 1975 deadline. ANC is an abbreviation for the Alaska Native Corporation, which are corporations formed under ANCSA. There are now 12 regional corporations and more than 200 Alaska Native village corporations. As a government agency, what is the advantage of contracting with an Alaska Native Corporation (ANC)? Alaska Native Corporation subsidiaries may be certified as 8(a) tribal entities by the Small Business Administration (SBA). This allows them to receive sole source government contracts, which exceed the normal competitive threshold of $3 million for services and $5 million for manufactured items. The SBA has determined that 8(a) concerns owned and controlled by economically disadvantaged Indian Tribes are eligible as defined under the stated federal Acquisitions regulation’s Indian Incentive Program. Where is this year’s Annual Meeting? When does voting begin? The Annual Meeting page has all of the current information for this year’s Annual Meeting (if the details have been finalized and announced). I own 100 shares in Calista. Why is it that some years I have 400 votes and other years I only have 300 votes? Certain corporations, including Calista, use a process called cumulative voting. With this method your votes are determined by taking the number of shares you own and multiplying it by the number of Board of Director seats being contested by election. Calista has 11 board members and there are 4 directors elected one year, another 4 the next year and 3 directors on the last year. On the years where there are 4 seats up for election you will have 400 votes (100 shares multiplied by 4 seats). On the year where there are 3 seats up for election you will have 300 votes. Does Calista provide assistance to shareholders who are starting or expanding a business? Neither Calista nor any of its subsidiaries or affiliated nonprofit organizations is chartered to provide financial or technical assistance for starting a business. The BIA also administers a small business loan program and provides workshops and counseling on how to start a small business. Additionally, many universities and community schools provide reference libraries, workshops, and technical assistance on starting a small business, developing business plans, and preparing commercial loan proposals. How do I request a donation from Calista? The success of any business can be measured in part by profitability and social responsibility. The Board of Directors sets a budget each year and has created specific guidelines to accommodate donation requests. Donation requests can be submitted with the appropriate donation request form. grants to provide assistance for these types of requests (see “immediate assistance” directly above).